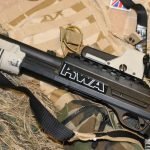 2019's Best Airsoft Rifle: 7 Assault, AEG, M4 & AK Reviewed. AirsoftCore. At Airsoft Core we know that airsoft rifles are one of the more desired types of guns to have for gameplay. 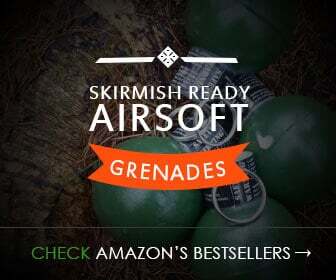 However it can be tough picking out a good gun, especially when you want the best airsoft rifle, because no one wants to have something that’s going to put them at a disadvantage. So what we’ve done is compiled a list of 7 of the best airsoft rifles for users to consider. These are some of the best in terms of price and brand. Potential users can think of them as a starting point. First we’re going to talk a little about the different types of airsoft assault rifles there are, after this we’ll get into the reviews. The G36 airsoft gun is a gun built to model the version that was designed and made early in the 1990s by Heckler & Koch, who were German manufacturers. The gun comes in a multitude of different variations to full sized rifles to CQB rifles that aren’t as long. The G36 model comes with features such as a foldable stock, and a complete G36K model includes a scope that’s on the top portion of the rail. A high quality G36 airsoft rifle will do a good job of modeling the real version and will serve a user well for CQB and assault skirmishing. These rifles are can be used with several components such as red dot signs, scopes, lasers as well as additional accessories. The M4 airsoft gun is modeled after the version that’s commonly used by different branches of the United States Armed Forces and U.S Military. 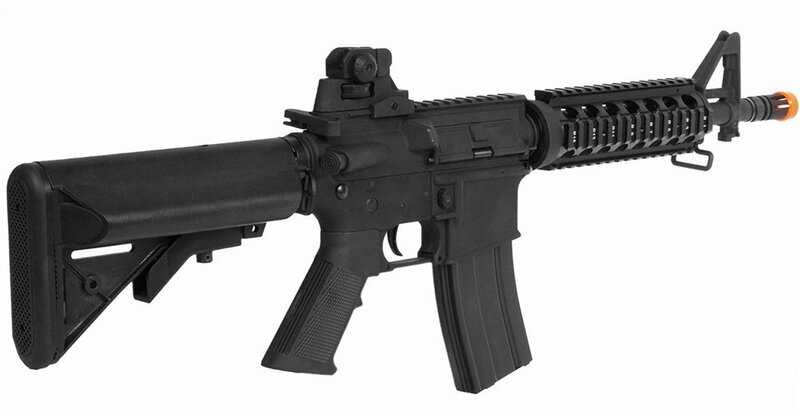 The M4 airsoft gun is designed to be lightweight and is a shorter carbine version. It’s a remake of the well-known M-16 rifle. The reason the M4 is different from a standard M16 would be due to the telescoping stock and barrel length not being as long. 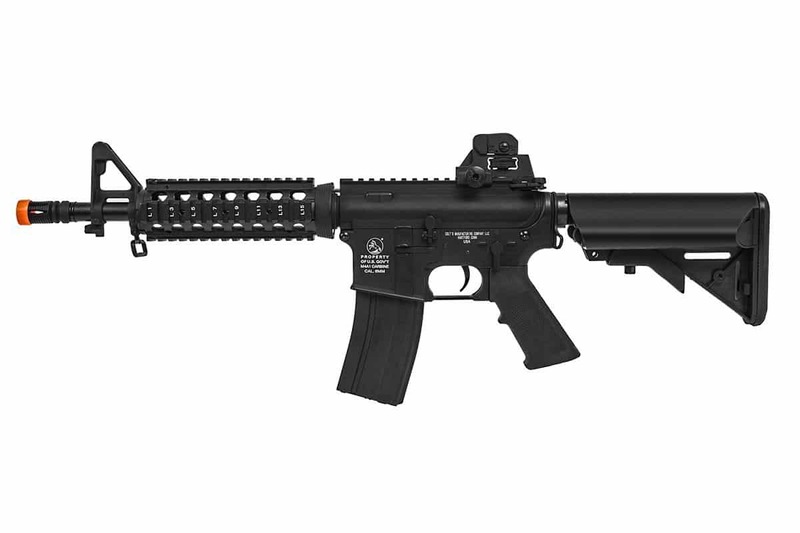 M4 airsoft rifles (which would include AEGs and rifles that are GBB blowback powered) are amongst the most commonly used in the game. This is due to their capabilities being modular and the fact that upgrade parts/accessories are easy to come by. 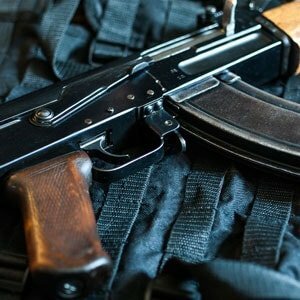 The AK is a gun that was created by a man named Mikhail Kalashnikov who lived in the Soviet Union during the period of 1947. As far as production it is one of the most mass produced guns with there being over 75 million created as of this day. The rifle was created with two different formals of stock, one being a fixed wood stock and the second being a stock that’s foldable metal. 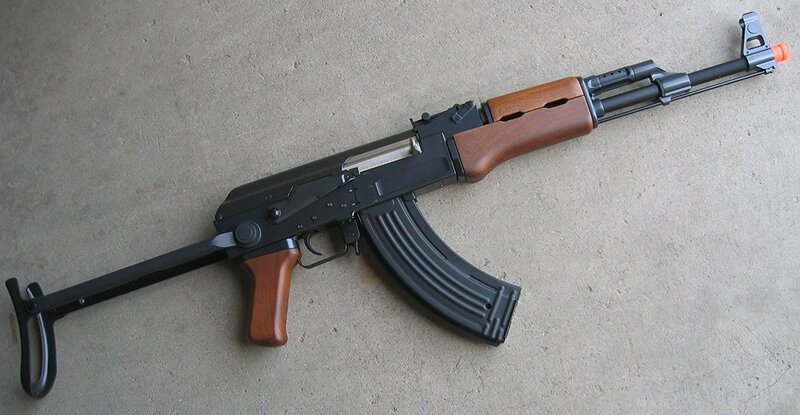 The AK is an airsoft gun that’s very versatile and is widely used around the world even to this day. 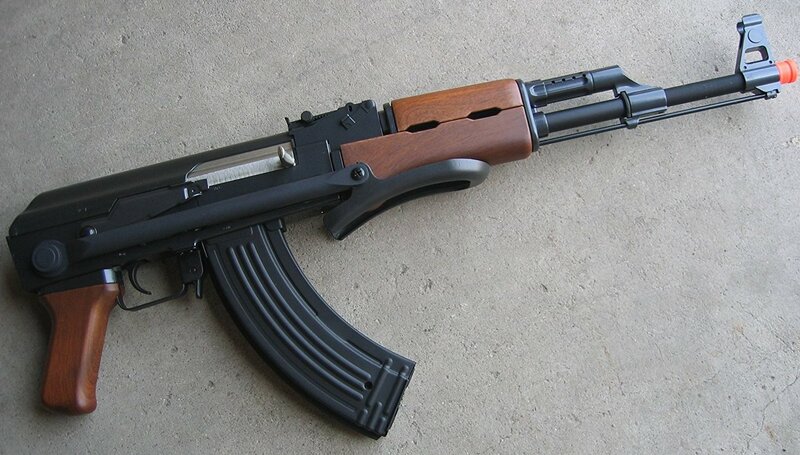 There are different versions of the AK airsoft rifle available (AKS, AK-74, RPK etc.) and some of the best known manufacturers in the game produce them. 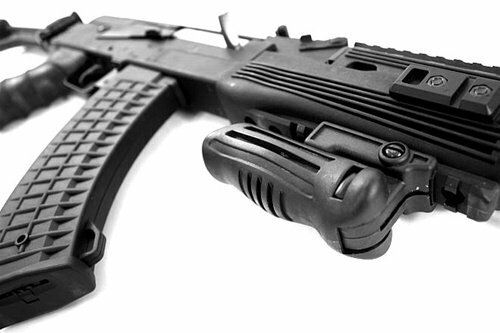 The AK version of airsoft rifles are a pretty solid option overall, providing superior accuracy and reliability. Now let’s get into reviewing 7 of the best airsoft assault rifles on the market (see our 2019’s 5 Best Airsoft Sniper Rifle guide here). The Colt M4 AEG CQB Automatic Electric 300 Round Airsoft Assault Rifle is a solid two tone desert tan and black M4 airsoft gun. It’s built using polymer and some additional metal parts. Other parts are mostly plastic such as the rail system, upper/lower body, furniture, stock sights and the buffer tube. The sling attachments, magazine, outer barrel and additional moveable pieces are comprised of metal. It can shoot anywhere from 350 to 400 FPS with high quality 0.20g BBs. BBs for this gun need to be seamless and well-polished in order to ensure good functionality. The sight is spot on in terms of accuracy and is able to adjust to suit the wind. Adds on such as a silencer can be put on with relative ease. Users will like how easily adaptable it is because of the tactical rail that’s located at the top and handguard. This airsoft rifle is modeled precisely like a real M4 and Colt licensed. Steel Gears and Metal Gearbox. CNC Machined R.I.S. Handguard. Metal 350rd Magazine. This product is restricted from shipment into the state of New York.Kindly refer the user manual attached below for troubleshooting steps and instructions. Rifle is completely metal which heightens the level of realism users will experience with this gun. The negative side to this is it’s heavier than what some might expect. Replacements parts are easy to get. Gun has lots of rails, which makes it easier for a user to mount whatever they might want on them. Gun isn’t hard to get accustomed to at all and there’s an adjustable stock that makes for superior comfort. Markings on the gun are very authentic looking and the clips fit very easily inside. The gun comes shipped without being properly lubricated, so this means when you take it out of the box there might be issues with it misfiring, dry fire issues and BBs not loading properly. So you will need to make sure you purchase some pure silicone oil spray to place within the hopper mechanism. Battery is connected to the stock in such a way that it’s impacted by either collapsing or extending it. Paint is kind of low quality and could come off with scraping. The gun tends to go off very loudly, which can be a problem in game play as this can give away where you are easily. 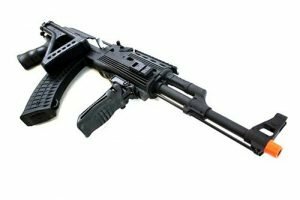 The Kalishnikov AK47 Tactical Electric AEG Airsoft Skirmish Rifle 330+ FPS is one of the more well known weapons of the 2oth century. 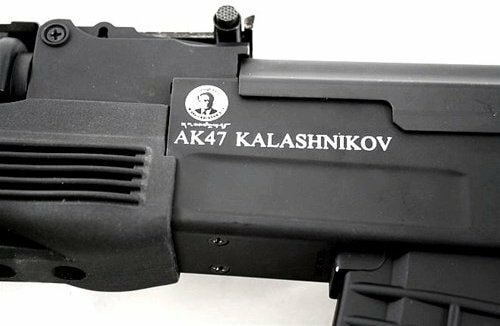 It has complete official Kalashnikov Trademarks. 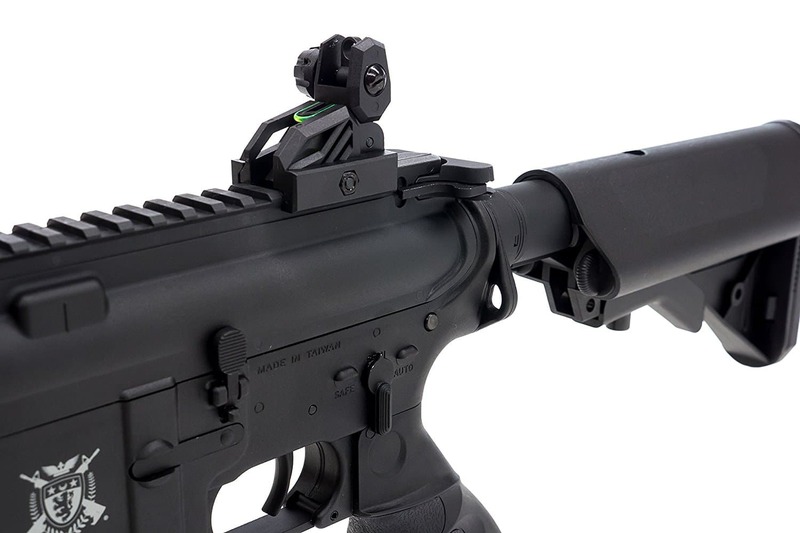 There are integrated tactical rails that make mounting different optics and accessories simple. The nylon fiberfolding stock and tight make it easy for those who like close quarter play. The gun has a dark black color that gives it a stealth look. It’s completely automatic and when used has the ability to fire as much as 600 rounds each minute while reaching velocities as high as 475 FPS. Shooting off a high amount of rounds each one after the next with good accuracy can be done. It comes in a package that’s not too big in order to make it easy for users to store it. It is created by Cybergun/Softair. Metal gearbox is complete metal as well as the gearbox. The magazine and stock are plastic though. Hop up feature can be easily adjusted and is capable of getting the range to near 90 yards. The tactical design of the gun makes it aesthetically more pleasing than the conventional Kalashnikov. Special Edition 60th. Anniv AK47 RIS. Including FULL Kalashnikov Trademarks and logo. Muzzle velocity of 330-380FPS with a .20g BB.and a Power range of approx. 66 yards. Adjustable Spin-Up Shooting System. Premium 8.4v 1200mah small "Stick" battery and Wall charger included. Weight of gun is what it needs to be in order to give it a realistic feel without overpowering users who might be on the smaller side. The quality is also solid. Gun is extra powerful without being too forceful. When practiced with it can penetrate aluminum cans and even scrap the bark from trees. Is very accurate, assuming a user has a fair level of skill. Hope up system is easy to make adjustments to as well as lock in. It comes with extras such as an additional mag, battery, sling, charger as well as a mag cranker. Sights can be modified easily and the rate of fire is very fast while maintaining a good level of accuracy. Magazine can be a little loose at times, but users won’t have to be worried about it falling out during play or practice. The battery installation can be a bit of a hassle. In some instances the stock case can prove difficult to unfold. The strap is good quality overall, but can be a bit fragile if handled in a rough fashion. 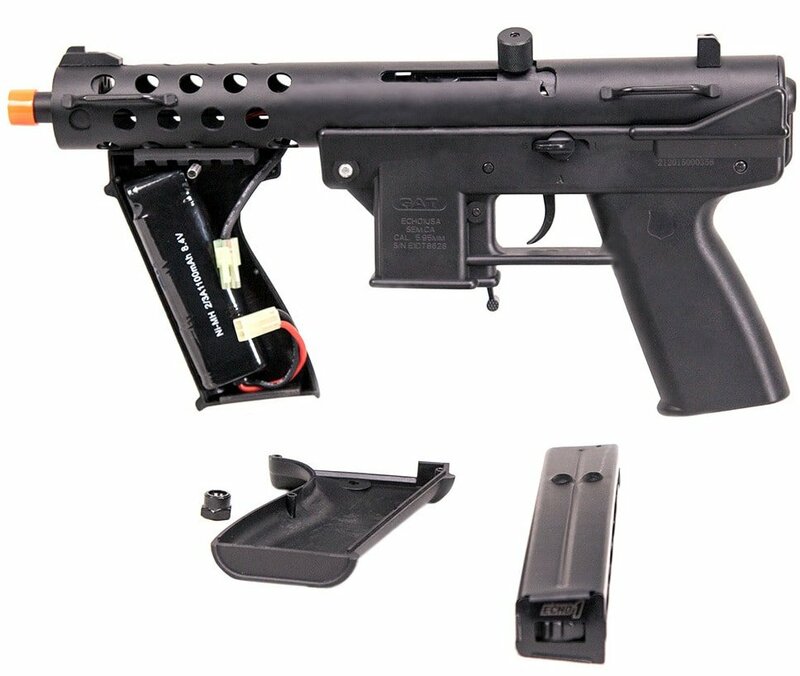 Users who are looking for an airsoft gun that’s going to enable them to be dominate as far as CQB airsoft skirmishes go will appreciate the Umarex Heckler & Koch 2279042 AEG Airsoft Rifle. The way the gun is designed comes from the AR15 platform and was thought of originally as a way to enhance the Colt M4 carbine. 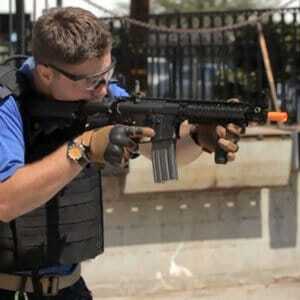 The body of the gun is mostly plastic and is able to be lugged around comfortable during intense airsoft wars. It has as one of its features a quad weaver/picatinny rail system as well as a top rail for putting on scopes and red dot sights. It has a magazine capacity of 250 rounds and shot velocity of about 330-350 fps (assuming one is using .12g BBs). Stock can be altered as can work well with users of different body types. Has 4 tactical rails that make for plenty of customization. Great value gun and a good bang for your buck, perfect for CQB. Gun is very lightweight, but at the same time sturdy. Its size overall is very close to what you’d get if you had the real thing. It’s very authentic looking and is properly licensed by HK. There are lots of functional mock pieces such as the forward assist as well as the charging handle. The metal magazine as well as the sights are one of the better aspects of this gun. The orange tip is rather large and because of this some users may look at it as being a bit over the top for regulations. In the beginning the batteries can be a little tough to put in. On top of this the battery can be easy to overcharge, chances are you’ll need to buy a smart charger too. At certain ranges the accuracy can start to come down a little, so you will need to adjust the hop up. It will vary, but this tends to happen at medium long range distances. The Double Eagle AK-47S Metal Electric 425 FPS Airsoft Assault Rifle is a completely automatic AEG with internals that are well reinforced. It has a barrel that’s full metal. Provides good speed at 330 FPS W/0.2G BB, 425 FPS W/0.12G BB. Gun can be shot in full auto/semi auto mode. It’s entirely a Tokyo Marui OEM replica AK47 AEG rifle. Hop up is adjustable. Users can expect to get a battery, BBs, instructions, chargers as well as a 400 round high magazine capacity. It weighs about 6 pounds and the length of the gun is about 36 inches. It has a black and wood color that’s very original. Is very nicely finished and can be relied on for a long time. This airsoft gun is just right for those who are collectors or those who are serious about action. Battery has a good charge life of about 2-4 hours, but this is going to be dependent on how heavily a person is playing with it. It’s a very well detailed gun and features things such as a moving fire selector, a charging handle that can be pulled back on as well as requiring a user to put in and take out the magazine the way they would if they had the real thing. Beautifully finished and extremely reliable! - Best Assualt Rifle of its class! There’s a lot of metal included with this gun, but there’s also a fair amount of plastic that’s high grade (meaning it’s very tough). Huge 400 capacity magazine, perfect for Close Quarter Games. Gun is very accurate even at moderately long distances. The rate of fire is pretty solid. The battery quality is good, but you should look to buy a smart charger to maintain battery life. The sling and glasses included with the gun might not be considered the best quality. 3 / 4 Hour battery charge time, means when skirmishing you’ll need a second battery. The Echo1 GAT Airsoft Submachine Gun (SMG) is a quality lightweight assault rifle designed for close quarter skirmish. With a compact design comes compromise, when you compare the Echo1 to the AK47 or M4’s previously reviewed by AirsoftCore you’ll see the magazine capacity is comparably small at 250 rounds, to combat this 2x magazines have been included. Though this is a durable gun designed for intermediate use, measuring in with a velocity of 330fps when using 0.20g 6mm BBs and some users reporting 360fps, this put the GAT in a strong position. Being a quality, sturdy gun with realistic weight for GAT, the Echo1 has reported to shoot up to 200ft – which for a small tactial assault rifle is respectable. Once out the box, batteries charged and magazine full, try it with a target and adjust the hop up, else you might find the BB’s curving due to the short barrel. Finally the downside of this airsoft rifle being the batteries are rather hard to get in and out, so whilst the 8.4v NiMH battery is good, it’ll take a little effort to get it out / put back in to charge. Airsoft rifle is able to shoot incredibly fast. For an SMG rifle it’s pretty accurate. The distances users will be able to get are pretty good considering this is an SMG. Gun is nicely built and as long as it’s taken proper care of it should last users a long time. People who want to handle this gun like they would a sidearm are going to find it problematic, because the gun does tend to be on the heavier side. The grip is good, but some will say that it still isn’t exactly the same as what you would get with the real thing. If you are looking to uprate the battery, you’ll only able to fit batteries into it that are on the small side. 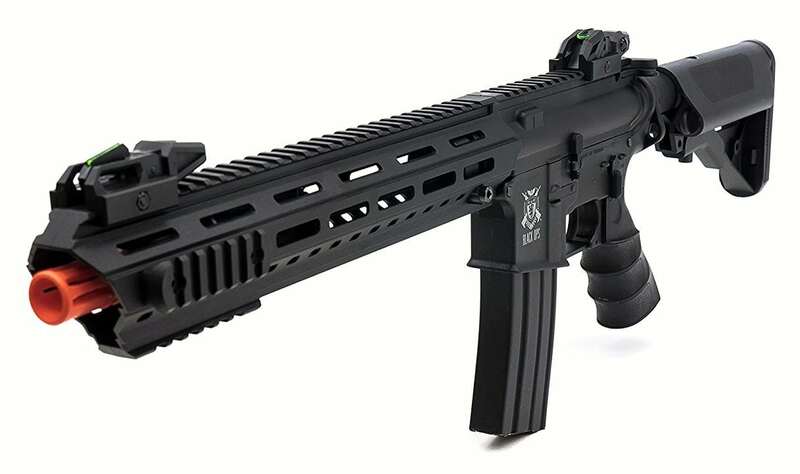 If you want an airsoft rifle that looks similar to the Sig Commando 552, then the Double Eagle M82p Commando Electric Airsoft Gun is what you’re looking for. It has firing models that are semi-automatic and fully automatic. This means users will have the chance to hit opponents with a single shot or shot at them using multiple rounds. There are accessories included with this airsoft rifle such as a silencer, flashlight, red dot sight, foregrip and a laser. All of this gives you an edge when it comes to actual play, especially against opponents who have inferior airsoft guns. This airsoft rifle is able to be made use of right out of the box and has everything a user is going to require included. The package comes with the gun, a battery with a wall charger, speed loader, safety glasses and a gun sling. Velocity is about 250 FPS and there’s an adjustable hop up system. The construction of the gun is heavyweight polymer. There’s an integrated top and bottom RIS rail system, which makes it easy to attach different tactical accessories. Velocity (FPS): Approx. 250 Adustable Hop Up System Can Shoot Semi and Full Automatic with the Flick of a Switch Heavyweight Polymer Body Construction! For the price of this airsoft rifle it has a pretty solid rate of fire and the FPS is also better than what you would expect for an airsoft gun in this price range. The weight of the piece is just the right balance between light and heavy, light enough to be easy to handle, but heavy enough to give a user a realistic feel. Some have said that the clip for this gun can be problematic, meaning that at times it isn’t able to handle full auto mode. Placing the clip on can be a bit frustrating at times, but it isn’t too difficult to do. Small magazine, worth buying a second and a speed loader. The Black Ops M4 Viper Mk5 Airsoft AEG Rifle from the makers Black Ops USA is an airsoft gun for those who want something that will make them more competitive. It has a nice solid build and it has a very nice aesthetic appeal to it. Its shooting ability is good and it comes with fiber optic flip up sights, a rail system that’s quick release and free floating and a crane stock that can be easily adjusted. Users will be able to get started using this piece for game play or practice right out of the box. There’s a receiver that lightweight and designed for superior durability. Internals are designed to help enhance accuracy. It can deliver about 420 FPS assuming the BBs are at least .12g. There’s a 8.4v 1100mAH battery included as well. The platform of the gun is nice and solid and makes upgrades and customization easy and it’s compatible with the majority of M45 internals. There’s lots of rail space for users to add things such as optics, grips, lights as well as additional accessories. With some add on such as a bipod and a scope this airsoft rifle can be one more the more superior options a user can have. Piece feels just like an AR and the controls are all made to be above average in terms of quality. Can be easily upgraded and is lipo ready. Quality AEG with 1 year warrantee. Can be a little loud, despite the fact that it’s supposed to be an electric powered piece. Sometimes the BBs can become a little jammed. One way to resolve this would be to make sure you properly clean and lube the piece. So which is the Best Airsoft Rifle? At Airsoft Core we want you to make a decision you can live with and use whatever airsoft rifle you get to improve your game by different means. 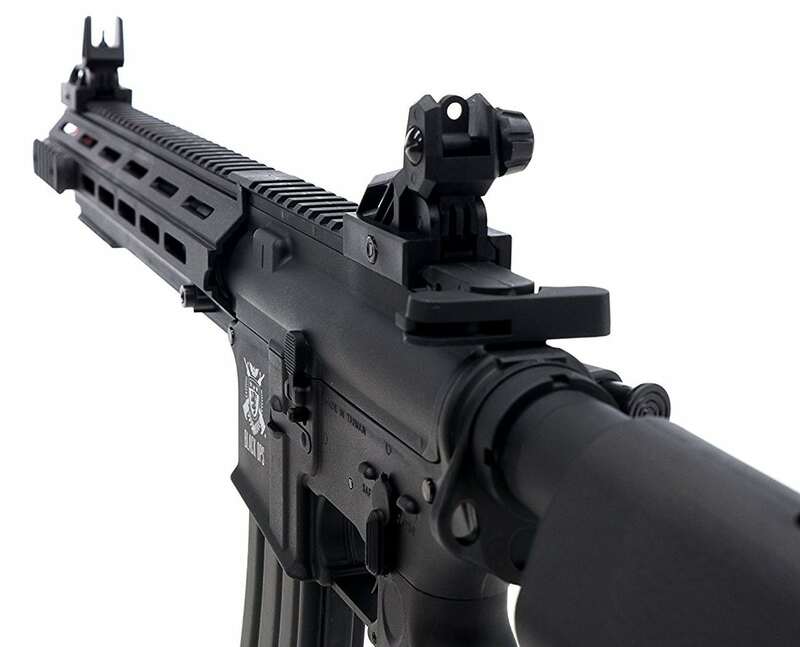 Here’s our summary of the 7 best airsoft assault rifles mentioned here. 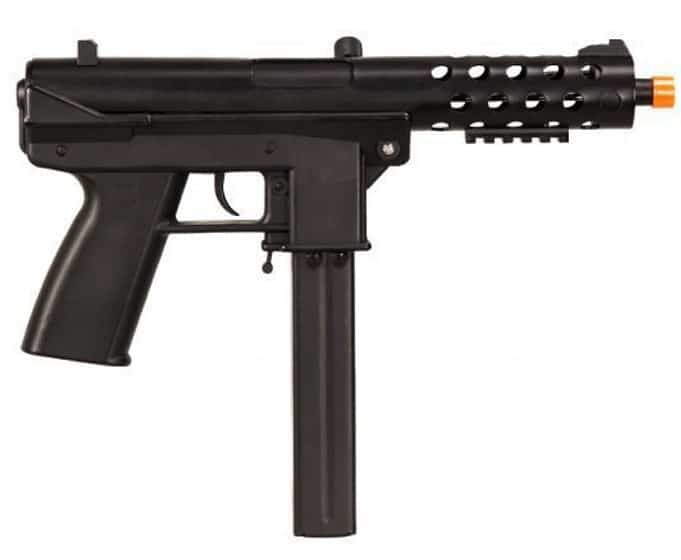 7If we have to give our opinion on the Double Eagle M82p Commando Electric Airsoft Gun at Airsoft Core we feel this gun is perfect option for newbies or for those who might not be able to afford more expensive models. If your goal is to go hard with this piece in an intense airsoft battle, then you will want to make sure to purchase additional magazines. 6Overall the Double Eagle AK-47S Metal Electric 425 FPS Airsoft Assault Rifle Gun is a nice gun that’s on the affordable side. It’s hard hitting, which means users will have to be careful with its use. Along with this it’s very accurate. Construction is high quality. All in all this airsoft rifle should provide what a user needs in order to get started off right on the field in play. 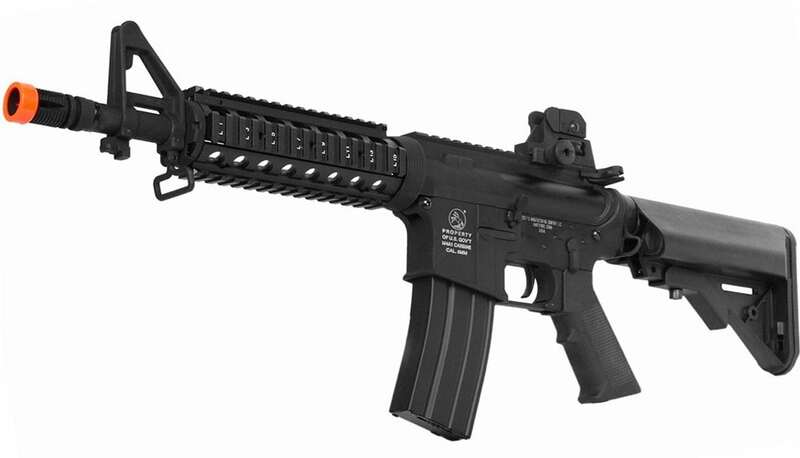 5The Colt M4 AEG CGB Automatic Electric 300 Round Airsoft Assault Rifle seems to be a gun that has all that’s needed for upgrades and makes for a very good starter rifle. The heaviness of it can be problematic for some, but this is offset by the accuracy and overall comfort of handling the gun. 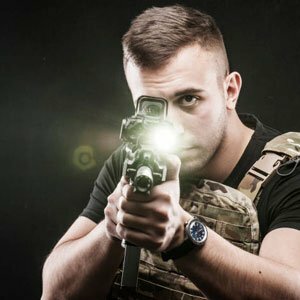 For serious airsoft players they won’t have a problem with hitting their targets each time. Overall it’s a very good gun, good quality and would also be a good fit for someone who wants to add it to a collection. We feel the Umarex Heckler & Koch 416 AEG Airsoft Rifle is a great option for users who just getting starters or for those who might be considered intermediate players. Overall it’s not the best airsoft rifle out there, but it does work well for those who are just getting into airsoft. The Heckler & Koch 2279042 H and K 416 AEG Black Electric Power Adv Air Soft is very simple to maintain, the sights are good in terms of accuracy and overall operating it can be quickly learned by anyone. 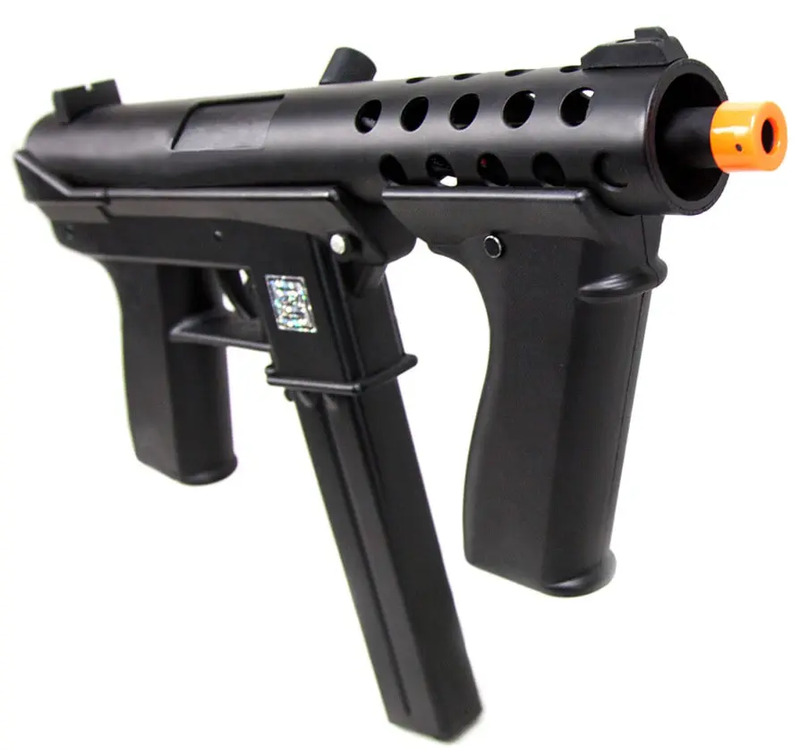 The Echo1 GAT General Assault Tool Electric Airsoft SMG is a little on the loud side, but most users shouldn’t mind this unless the goal is to hide yourself as to not give away your position during play. When holding the gun you’re going to know right away that it’s not some inferior option. The range is good and is able to shoot fairly far. 2Overall the weight of the Black Ops M4 Viper Mk5 Airsoft AEG Rifle is good, but it does appear that if the goal is intense airsoft play this wouldn’t be the best piece to have. It does shoot well and the feel is pretty solid. We feel it would work best for someone who is just getting started in the game and wants to wet their beak with something that won’t be too intimidating. 1With the Kalishnikov AK47 Tactical Electric AEG Airsoft Skirmish Rifle 330+ FPS it becomes easy to see that a lot of attention was paid to detail when putting it together, because it looks really authentic. It can be a little heavier than what some users might want, but for others this will be right up their alley. There are airsoft gun options out there that cost far more and are made from primarily plastic. Not the case with this gun as it’s mostly metal and even the parts that are plastic are high grade. So what’s the AirsoftCore’s Assault Airsoft Rifle of Choice? With the Kalishnikov AK47 Tactical Electric AEG Airsoft Skirmish Rifle 330+ FPS it becomes easy to see that a lot of attention was paid to detail when putting it together, because it looks really authentic. It can be a little heavier than what some users might want, but for others this will be right up their alley. There are airsoft gun options out there that cost far more and are made from primarily plastic. Not the case with this gun as it’s mostly metal and even the parts that are plastic are high grade. 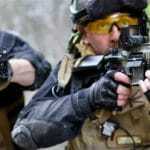 Looking for another type of airsoft gun, check out our must read Best Airsoft Gun guide here. 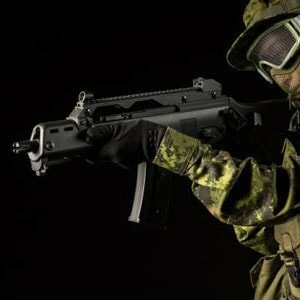 2019's Best 8 Airsoft Guns. Assault, Sniper Rifle, Pistol & Shotgun. Budget vs Pro.